Niger ( IPA) /niːˈʒɛə(ɹ)/, US variant: /ˈnaɪdʒə(ɹ)/) , officially the Republic of Niger, is a landlocked country in Western Africa, named after the Niger River. It borders Nigeria and Benin to the south, Burkina Faso and Mali to the west, Algeria and Libya to the north and Chad to the east. 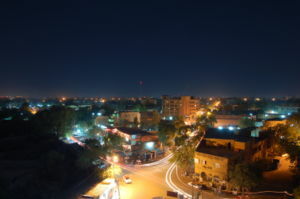 The capital city is Niamey. 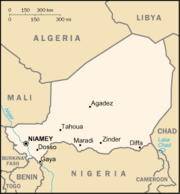 The adjective form of Niger is Nigerien /niːˈʒɛɹiən/ (var. /naɪdʒɪɹiˈɛn/), which should not be confused with Nigerian /naɪˈdʒiɹiən/ for Nigeria and derives from the French nigérien, -ne. There are different opinions about the adjective form however. Merriam-Webster lists Nigerois (which has, despite its sound, no equivalent form in French) only as the noun form. However, there are instances of Nigerois having been used adjectivally. CNN and other news sources often circumvent using the adjective altogether, using the noun instead, e.g. 'the Niger parliament', 'Niger leader slain' or 'Niger's capital', 'Niger's people'. In French, the citizens of Niger use the adjective 'nigérien'. During recent centuries, the nomadic Tuareg formed large confederations, pushed southward, and, siding with various Hausa states, clashed with the Fulani Empire of Sokoto, which had gained control of much of the Hausa territory in the late 18th century. In the 19th century, contact with the West began when the first European explorers—notably Mungo Park (British) and Heinrich Barth (German)—explored the area, searching for the source of the Niger River. Although French efforts at pacification began before 1900, dissident ethnic groups, especially the desert Tuareg, were not subdued until 1922, when Niger became a French colony. Niger's colonial history and development parallel that of other French West African territories. France administered its West African colonies through a governor general in Dakar, Senegal, and governors in the individual territories, including Niger. In addition to conferring French citizenship on the inhabitants of the territories, the 1946 French constitution provided for decentralization of power and limited participation in political life for local advisory assemblies. A further revision in the organization of overseas territories occurred with the passage of the Overseas Reform Act (Loi Cadre) of July 23, 1956, followed by reorganizational measures enacted by the French Parliament early in 1957. In addition to removing voting inequalities, these laws provided for creation of governmental organs, assuring individual territories a large measure of self-government. After the establishment of the Fifth French Republic on December 4, 1958, Niger became an autonomous state within the French Community. Following full independence on August 3, 1960, however, membership was allowed to lapse. For its first 14 years as an independent state, Niger was run by a single-party civilian regime under the presidency of Hamani Diori. In 1974, a combination of devastating drought and accusations of rampant corruption resulted in a military coup that overthrew the Diori regime. Col. Seyni Kountché and a small military group ruled the country until Kountché's death in 1987. He was succeeded by his Chief of Staff, Col. Ali Saibou, who released political prisoners, liberalized some of Niger's laws and policies, and promulgated a new constitution. However, President Saibou's efforts to control political reforms failed in the face of union and student demands to institute a multi-party democratic system. The Saibou regime acquiesced to these demands by the end of 1990. New political parties and civic associations sprang up, and a national conference was convened in July 1991 to prepare the way for the adoption of a new constitution and the holding of free and fair elections. The debate was often contentious and accusatory, but under the leadership of Prof. André Salifou, the conference developed consensus on the modalities of a transition government. A transition government was installed in November 1991 to manage the affairs of state until the institutions of the Third Republic were put into place in April 1993. While the economy deteriorated over the course of the transition, certain accomplishments stand out, including the successful conduct of a constitutional referendum; the adoption of key legislation such as the electoral and rural codes; and the holding of several free, fair, and non-violent nationwide elections. Freedom of the press flourished with the appearance of several new independent newspapers. Rivalries within a ruling coalition elected in 1993 led to governmental paralysis, which provided Col. Ibrahim Baré Maïnassara a rationale to overthrow the Third Republic in January 1996. While leading a military authority that ran the government ( Conseil de Salut National) during a 6-month transition period, Baré enlisted specialists to draft a new constitution for a Fourth Republic announced in May 1996. Baré organized a presidential election in July 1996. While voting was still going on, he replaced the electoral commission. The new commission declared him the winner after the polls closed. His party won 90% of parliament seats in a flawed legislative election in November 1996. When his efforts to justify his coup and subsequent questionable elections failed to convince donors to restore multilateral and bilateral economic assistance, a desperate Baré ignored an international embargo against Libya and sought Libyan funds to aid Niger's economy. In repeated violations of basic civil liberties by the regime, opposition leaders were imprisoned; journalists often arrested, and deported by an unofficial militia composed of police and military; and independent media offices were looted and burned. As part of an initiative started under the 1991 national conference, however, the government signed peace accords in April 1995 with all, meaning Tuareg and Toubou groups that had been in rebellion since 1990. The Tuareg claimed they lacked attention and resources from the central government. The government agreed to absorb some former rebels into the military and, with French assistance, help others return to a productive civilian life. Mamadou Tandja, President of the Republic of Niger. Niger's new constitution was approved in July 1999. It restored the semi-presidential system of government of the December 1992 constitution (Third Republic) in which the president of the republic, elected by universal suffrage for a five-year term, and a prime minister named by the president share executive power. As a reflection of Niger's increasing population, the unicameral National Assembly was expanded in 2004 to 113 deputies elected for a 5 year term under a majority system of representation. Political parties must attain at least 5% of the vote in order to gain a seat in the legislature. The constitution also provides for the popular election of municipal and local officials, and the first-ever successful municipal elections took place 24 July 2004. The National Assembly passed in June 2002 a series of decentralization bills. As a first step, administrative powers will be distributed among 265 communes (local councils); in later stages, regions and departments will be established as decentralized entities. A new electoral code was adopted to reflect the decentralization context. The country is currently divided into 8 regions, which are subdivided into 36 districts (departments). The chief administrator (Governor) in each department is appointed by the government and functions primarily as the local agent of the central authorities. The current legislature elected in December 2004 contains seven political parties. President Mamadou Tandja was re-elected in December 2004 and reappointed Hama Amadou as Prime Minister. Mahamane Ousmane, the head of the CDS, was re-elected President of the National Assembly (parliament) by his peers. The new second term government of the Fifth Republic took office on 30 December 2002. In August 2002, serious unrest within the military occurred in Niamey, Diffa, and Nguigmi, but the government was able to restore order within several days. Niger is a landlocked nation in West Africa located along the border between the Sahara and Sub-Saharan regions. Its geographic coordinates are longitude 16°N and latitude 8°E. Its area is 1,267,000 square kilometres (489,000 sq mi) of which 300 square kilometres (115 sq mi) is water. This makes Niger slightly less than twice the size of the U.S. state of Texas, and the world's twenty-second largest country (after Chad). Niger is comparable in size to Angola. Niger borders seven countries on all sides and has a total of 5,697 kilometres (3,540 mi) of borders. The longest border is Nigeria to the south (1,497 km; 930 mi). This is followed by Chad to the east, at 1,175 kilometres (730 mi), Algeria to the north-northwest (956 km; 594 mi), and Mali at 821 kilometres (510 mi). Niger also has small borders in its far southwest frontier with Burkina Faso at 628 kilometres (390 mi) and Benin at 266 kilometres (165 mi) and to the north-northeast (Libya at 354 kilometres (220 mi). Niger's subtropical climate is mainly very hot and dry, with much desert area. In the extreme south there is a tropical climate on the edges of the Niger River basin. The terrain is predominantly desert plains and sand dunes, with flat to rolling savannah in the south and hills in the north. The lowest point is the Niger River, with an elevation of 200 metres (722 ft). The highest point is Monts Bagzane at 2,022 metres (6,634 ft). Niger is the poorest country in the world, ranking last on the United Nations Development Programme's Human Development Index. It is a landlocked, sub-Saharan nation, whose economy centers on subsistence crops, livestock, and some of the world's largest uranium deposits. Drought cycles, desertification, a 2.9% population growth rate, and the drop in world demand for uranium have undercut the economy. In December 2000, Niger qualified for enhanced debt relief under the International Monetary Fund program for Heavily Indebted Poor Countries (HIPC) and concluded an agreement with the Fund for Poverty Reduction and Growth Facility (PRGF). Debt relief provided under the enhanced HIPC initiative significantly reduces Niger's annual debt service obligations, freeing funds for expenditures on basic health care, primary education, HIV/AIDS prevention, rural infrastructure, and other programs geared at poverty reduction. In December 2005, it was announced that Niger had received 100% multilateral debt relief from the IMF, which translates into the forgiveness of approximately $86 million USD in debts to the IMF, excluding the remaining assistance under HIPC. Nearly half of the government's budget is derived from foreign donor resources. Future growth may be sustained by exploitation of oil, gold, coal, and other mineral resources. Uranium prices have recovered somewhat in the last few years. A drought and locust infestation in 2005 led to food shortages for as many as 2.5 million Nigeriens. Uranium is Niger's largest export. Foreign exchange earnings from livestock, although difficult to quantify, are second. Actual exports far exceed official statistics, which often fail to detect large herds of animals informally crossing into Nigeria. Some hides and skins are exported, and some are transformed into handicrafts. The persistent uranium price slump has brought lower revenues for Niger's uranium sector, although uranium still provides 72% of national export proceeds. The nation enjoyed substantial export earnings and rapid economic growth during the 1960s and 1970s after the opening of two large uranium mines near the northern town of Arlit. 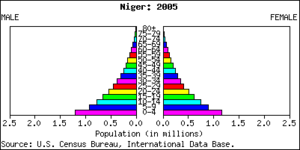 When the uranium-led boom ended in the early 1980s, however, the economy stagnated, and new investment since then has been limited. Niger's two uranium mines--SOMAIR's open pit mine and COMINAK's underground mine--are owned by a French-led consortium and operated by French interests. Exploitable deposits of gold are known to exist in Niger in the region between the Niger River and the border with Burkina Faso. On October 5, 2004 President Tandja announced the official opening of the Samira Hill Gold Mine in the region of Tera and the first Nigerien gold ingot was presented to him. This marked a historical moment for Niger as the Samira Hill Gold Mine represents the first commercial gold production in the country. Samira Hill is owned by a company called SML (Societe des Mines du Liptako) which is a joint venture between a Moroccan company, Societe Semafo, and a Canadian company, Etruscan Resources. Both companies own 80% (40% - 40%) of SML and the Government of Niger 20%. The first year’s production is predicted to be 135,000 troy ounces (4,200 kg; 9,260 lb avoirdupois) of gold at a cash value of USD 177 per ounce ($5.70/g). The mine reserves for the Samira Hill mine total 10,073,626 tons at an average grade of 2.21 grams per ton from which 618,000 troy ounces (19,200 kg; 42,400 Lb) will be recovered over a 6 year mine life. SML believes to have a number of significant gold deposits within what is now recognized as the gold belt known as the "Samira Horizon". Substantial deposits of phosphates, coal, iron, limestone, and gypsum also have been found in Niger. Niger has oil potential. In 1992, the Djado permit was awarded to Hunt Oil, and in 2003 the Tenere permit was awarded to the China National Petroleum Company. An ExxonMobil- Petronas joint venture now holds the sole rights to the Agadem block, north of Lake Chad, and oil exploration is ongoing. The parastatal SONICHAR (Societe Nigerienne de Charbon) in Tchirozerine (north of Agadez) extracts coal from an open pit and fuels an electricity generating plant that supplies energy to the uranium mines. There are additional coal deposits to the south and west that are of a higher quality and may be exploitable. The economic competitiveness created by the January 1994 devaluation of the Communaute Financiere Africaine (CFA) franc contributed to an annual average economic growth of 3.5% throughout the mid-1990s. But the economy stagnated due to the sharp reduction in foreign aid in 1999 (which gradually resumed in 2000) and poor rains in 2000. Reflecting the importance of the agricultural sector, the return of good rains was the primary factor underlying economic growth of 5.1% in 2000, 3.1% in 2001, 6.0% in 2002, and 3.0% in 2003. Niger shares a common currency, the CFA franc, and a common central bank, the Central Bank of West African States (BCEAO), with seven other members of the West African Monetary Union. The Treasury of the Government of France supplements the BCEAO's international reserves in order to maintain a fixed rate of 656 CFA to the euro. In January 2000, Niger's newly elected government inherited serious financial and economic problems, including a virtually empty treasury, past-due salaries (11 months of arrears) and scholarship payments, increased debt, reduced revenue performance, and lower public investment. In December 2000, Niger qualified for enhanced debt relief under the International Monetary Fund (IMF) program for Highly Indebted Poor Countries (HIPC) and concluded an agreement with the Fund on a Poverty Reduction and Growth Facility (PRGF). In January 2001, Niger reached its decision point and subsequently reached its completion point in 2004. Total relief from all of Niger's creditors is worth about $890 million, corresponding to about $520 million in net present value (NPV) terms, which is equivalent to 53.5% of Niger’s total debt outstanding as of 2000. The debt relief provided under the enhanced HIPC initiative significantly reduces Niger's annual debt service obligations, freeing about $40 million per year over the coming years for expenditures on basic health care, primary education, HIV/AIDS prevention, rural infrastructure, and other programs geared at poverty reduction. The overall impact on Niger's budget is substantial. Debt service as a percentage of government revenue will be slashed from nearly 44% in 1999 to 10.9% in 2003 and average 4.3% during 2010- 19. The debt relief cuts debt service as a percentage of export revenue from more than 23% to 8.4% in 2003, and decreases it to about 5% in later years. In addition to strengthening the budgetary process and public finances, the Government of Niger has embarked on an ambitious program to privatize 12 state-owned companies. To date, seven have been fully privatized, including the water and telephone utilities, with the remainder to be privatized in 2005. A newly installed multisectoral regulatory agency will help ensure free and fair competition among the newly privatized companies and their private sector competitors. In its effort to consolidate macroeconomic stability under the PRGF, the government is also taking actions to reduce corruption, and as the result of a participatory process encompassing civil society, has devised a Poverty Reduction Strategy Plan that focuses on improving health, primary education, rural infrastructure, agricultural production, environmental protection, and judicial reform. The importance of external support for Niger's development is demonstrated by the fact that about 45% of the government's FY 2002 budget, including 80% of its capital budget, derived from donor resources. The most important donors in Niger are France, the European Union, the World Bank, the IMF, and UN agencies-- UNDP, UNICEF, FAO, WFP, and UNFPA. Other donors include the United States, Belgium, Germany, Switzerland, Japan, China, Italy, Libya, Egypt, Morocco, Iran, Denmark, Canada, and Saudi Arabia. While the U.S. Agency for International Development (USAID) does not have an office in Niger, the United States is a major donor, contributing on average $8 million each year to Niger’s development increasing to $12 million in FY 2004. The United States also is a major partner in policy coordination in food security, education, water management and HIV/AIDS sectors. 80% of people in Niger are employed. Niger pursues a moderate foreign policy and maintains friendly relations with the West and the Islamic world as well as nonaligned countries. It belongs to the United Nations and its main specialized agencies and in 1980-81 served on the UN Security Council. Niger maintains a special relationship with France and enjoys close relations with its West African neighbors. It is a charter member of the African Union and the West African Monetary Union and also belongs to the Niger River and Lake Chad Basin Commissions, the Economic Community of West African States, the Nonaligned Movement, and the Organization of the Islamic Conference. The westernmost regions of Niger are joined with contiguous regions Mali and Burkina Faso under the Liptako-Gourma Authority. The border dispute with Benin, inherited from colonial times and concerning inter alia Lete Island in the River Niger was finally solved by the ICJ in 2005 to Niger's advantage. The Niger Armed Forces total 10,000 personnel with approximately 3,700 gendarmes, 300 air force, and 6,000 army personnel. The air force has four operational transport aircraft. The armed forces include general staff and battalion task force organizations consisting of two paratroop units, four light armored units, and nine motorized infantry units located in Tahoua, Agadez, Dirkou, Zinder, Nguigmi, N'Gourti, and Madewela. Since January 2003, Niger has deployed a company of troops to Cote d’Ivoire as part of the ECOWAS stabilization force. In 1991, Niger sent four hundred military personnel to join the American-led allied forces against Iraq during the Gulf War. Niger's defense budget is modest, accounting for about 1.6% of government expenditures. France provides the largest share of military assistance to Niger. Morocco, Algeria, China, and Libya have also provided military assistance. Approximately 15 French military advisers are in Niger. Many Nigerien military personnel receive training in France, and the Nigerien Armed Forces are equipped mainly with material either given by or purchased in France. In the past, U.S. assistance focused on training pilots and aviation support personnel, professional military education for staff officers, and initial specialty training for junior officers. A small foreign military assistance program was initiated in 1983. A U.S. Defense Attaché office opened in June 1985 and assumed Security Assistance Office responsibilities in 1987. The office closed in 1996 following a coup d'état. A U.S. Defense Attaché office reopened in July 2000. The United States provided transportation and logistical assistance to Nigerien troops deployed to Cote d’Ivoire in 2003. Additionally, the U.S. provided initial equipment training on vehicles and communications gear to a select contingent of Nigerien soldiers as part of the Department of State Pan-Sahel Initiative. The largest ethnic groups in Niger are the Hausa, who also constitute the major ethnic group in northern Nigeria, and the Djerma-Songhai, who also are found in parts of Mali. Both groups, along with the Gourmantche, are sedentary farmers who live in the arable, southern tier of the country. The remainder of Nigeriens are nomadic or semi-nomadic livestock-raising peoples-- Fulani, Tuareg, Kanuri, Arabs, and Toubou. With rapidly growing populations and the consequent competition for meager natural resources, lifestyles of agriculturalists and livestock herders have come increasingly into conflict in Niger in recent years. Niger's high infant mortality rate is comparable to levels recorded in neighboring countries. However, the child mortality rate (deaths among children between the ages of 1 and 4) is exceptionally high (248 per 1,000) due to generally poor health conditions and inadequate nutrition for most of the country's children. According to the organization Save the Children, Niger has the world's highest infant mortality rate . Nonetheless, Niger has the highest fertility rate in the world (7.2 births per woman); this means that nearly half (49%) of the Nigerien population is under age 15. Between 1996 and 2003, primary school attendance was around 30% , including 36% of males and only 25% of females. Additional education occurs through madrassas.